Whether you choose a self-catered wedding or use a caterer for your wedding, you have to bear in mind the costs. 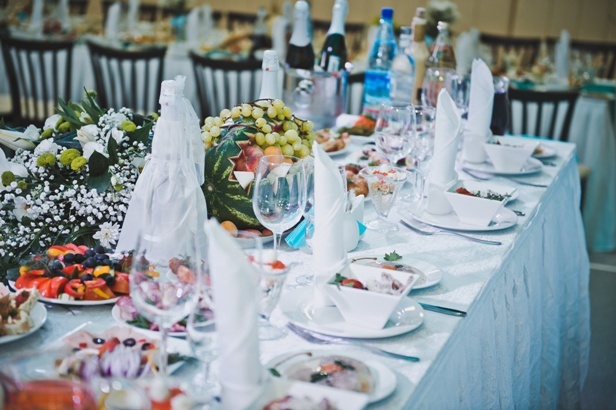 As a rule of thumb, about 25-30% of your wedding budget should be dedicated to catering. Self-catering your wedding shouldn’t be considered just a way to reduce your wedding costs simply because it’s so much more than that! Making a detailed list when it comes to a self-catered wedding is essential for your success as the queen of DIY wedding catering. Do your research and make sure to include in the list all those little details that will eventually make your guests feel special and well taken care of when it comes to the food and drinks at your wedding. Self-catering your wedding can be a lot of fun, but it is also a great opportunity to include family members and close friends in the process. This will guarantee you numerous memorable moments and a lot of delicious dishes you wouldn’t have managed to prepare yourself. Just ask your favorite aunt for her special chicken curry recipe or ask your mom to prepare her specialty cake and everyone will feel at home at the wedding – what a great way to incorporate your family traditions in your wedding reception! Just like when having special guests for dinner, you want to show your best. Don’t experiment with something you haven’t prepared before or some fancy recipes that take up eternity to make. Stick to simple seasonal dishes and recipes that run in the family – thus you will both save yourself the hard work and guarantee your guests dishes that they will all enjoy. Having fun is an essential part of self-catering your wedding. This is the time to create memories and enjoy the whole process – don’t be afraid to ask for help and let your creative energy flow into the delicious meals you have already planned. Cooking can be so much fun and, having decided on a self-catered wedding, you know it better than us! Why bother taking care of your wedding catering if you don’t show some creativity? Don’t limit your imagination to cooking only, though! Wow your guests by printing the recipes to the home made dishes served at the wedding. Thus every guest can take home the recipe to their favorite dish and the next time you visit them they may surprise you with their interpretation of a dish that has been served at your wedding, for example. You can even make a competition!